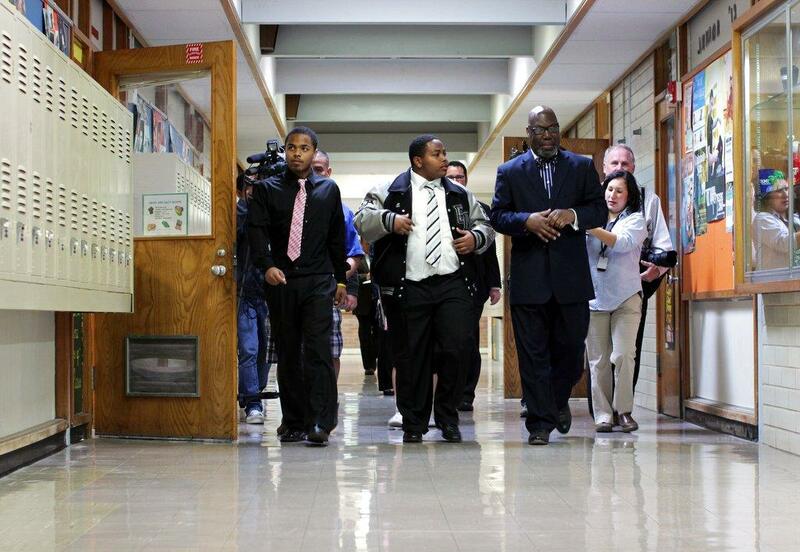 Texas Education Commission Michael Williams visiting Eastside Memorial High School earlier this year. The state's top education official has approved a plan by Austin Independent School District that will allow Eastside Memorial High School to remain open. The campus had faced closure after years of failing to meet the state's academic benchmarks and after the Austin school board voted to discontinue a contract it had with the South Texas-based charter school operator IDEA that aimed to reverse sagging outcomes. Texas Education Commissioner Michael Williams made the announcement Wednesday evening at a commencement ceremony for the 129 graduating seniors at Eastside Memorial. "Eastside Memorial High School shall continue. I look forward to many, many more Eastside Memorial graduations." he said as graduates, parents and friends cheered. The new plan will see Eastside Memorial partner with educators from Johns Hopkins University School of Education, whose Talent Development Secondary program includes a heavy emphasis on teacher training and professional development. The "turnaround plan" for Eastside Memorial includes a focus on the elementary and middle schools that feed into it. “Working closely with staff at the Texas Education Agency, AISD has developed an academic plan for Eastside Memorial High School that contains many strong components critical to student success,” Williams said later in a statement emailed to the media. But the future of the campus is still uncertain. If Eastside Memorial receives a rating of "academically unacceptable" from the state in the 2014-15 and 2015-16 school years, the campus will be shuttered and students will go to other high schools. "This is a school that unfortunately has had its up and downs, and has more downs than any of us would’ve wanted," Williams said at a media briefing after the announcement. "I think its important when you’ve had the kind of difficulties behind Eastside Memorial that we put a hard line of when were going to get to the finish line." After the school board approved a contract with Johns Hopkins last month, Williams said he was concerned it did not include a plan for the elementary and middle schools that feed into Eastside. It's a concept AISD tried last year when it contracted with IDEA Public Schools at Allan Elementary. Commissioner Williams says this plan focuses more on professional development. "It's the creation of the learning centers, there's quarterly reports that have to come back to agency, there's reviews we're going to be doing," Williams said. "So the way IDEA Allan was going to be doing it was one way, this is another way of trying to provide support for that vertical team, they just happen to be different." On Monday, the school board allocated $5.3 million dollars to implement the program at Eastside Memorial. Alumni from Johnston High School, now known as Eastside Memorial High School, are voicing concern over the likely takeover of their former campus by John Hopkins University. Austin ISD signed a contract with Johns Hopkins as part of a state-mandated effort to revive sagging test scores at the school. But Texas Education Commissioner Michael Williams still has to approve the plan, or shut down the campus.